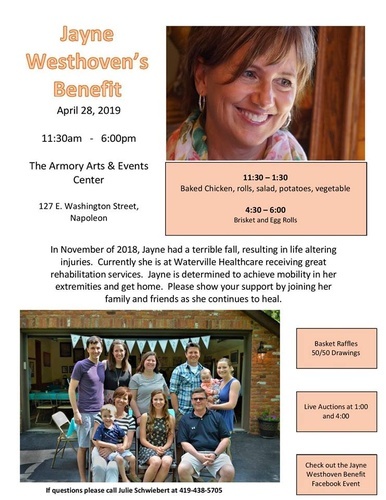 In November of 2018, Jayne had a terrible fall, resulting in life altering injuries. Currently she is at Waterville Healthcare received great rehabilitation services. Jayne is determined to achieve mobility in her extremities and get home. Please show your support by joining her family and friends as she continues to heal. There will be basket raffles and 50/50 drawings throughout the day, as well as live auctions at 1:00 and 4:00 p.m. Lunch and dinner will be available for a free will donation. Lunch will be served from 11:30 a.m. - 1:30 p.m. and includes baked chicken, roll, salad, potatoes, and vegetable. Dinner will be available from 4:30 - 6:00 p.m. and includes brisket, egg rolls, and sides. Face painting and chair massages will also be available for a free will donation. We will also be selling raffle tickets before the event with the drawing to be held that day (need not be present to win). Tickets are $20 each and first prize is a beef quarter and second prize is $100 cash. If you are interested in purchasing a ticket, please contact me (Jennifer Schwiebert) on Facebook. Watch the Facebook page for more information as the event gets closer. For questions, contact Julie Schwiebert at (419) 438-5705 or contact us through Facebook.